Research has well-established the link between good self-esteem and relationship satisfaction. Self-esteem not only affects how we think about ourselves but also how much love we’re able to receive and how we treat others, especially in intimate relationships. A person’s initial level of self-esteem prior to the relationship predicts partners’ common relationship satisfaction. More specifically, although happiness generally declines slightly over time, this isn’t true for people who enter a relationship with higher levels of self-esteem. But the steepest decline is for people whose self-esteem was lower to begin with. Frequently, those relationships don’t last. Even though communication skills, emotionality, and stress all influence a relationship, a person’s past experience, and personality traits affect how these issues are managed and therefore have the greatest bearing on its outcome. Self-esteem suffers when you grow up in a dysfunctional family. Often you don’t have a voice. Your opinions and desires aren’t taken seriously. Parents usually have low self-esteem and are unhappy with each other. 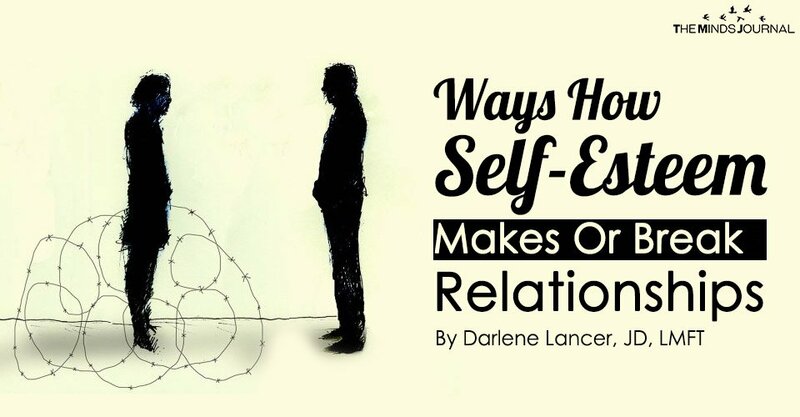 They themselves neither have nor model good relationship skills, including cooperation, healthy boundaries, assertiveness, and conflict resolution. They may be abusive, or just indifferent, preoccupied, controlling, interfering, manipulative, or inconsistent. Their children’s feelings and personal traits and needs tend to be shamed. As a result, a child feels emotionally abandoned and concludes that he or she is at fault–not good enough to be acceptable to both parents. This is how toxic shame becomes internalized. Children feel insecure, anxious, and/or angry. They don’t feel safe to be, to trust, and to like themselves. They grow up codependent with low self-esteem and learn to hide their feelings, walk on eggshells, withdraw, and try to please or become aggressive. As a result of their insecurity, shame, and impaired attachment style that, to varying degrees, is anxious or avoidant. They develop anxious and avoidant attachment styles and behave like pursuers and distances described in “The Dance of Intimacy.” At the extreme ends, some individuals cannot tolerate either being alone or too close; either one creates intolerable pain. Anxiety can lead you to sacrifice your needs and please and accommodate your partner. Due to basic insecurity, you’re preoccupied with the relationship and highly attuned to your partner, worrying that he or she wants less closeness. But because you don’t get your needs met, you become unhappy. Adding to this, you take things personally with a negative twist, projecting negative outcomes. Low self-esteem makes you hide your truth so as not to “make waves,” which compromises real intimacy. You may also be jealous of your partner’s attention to others and call or text frequently, even when asked not to. By repeated attempts to seek reassurance, you unintentionally push your partner away even further. Both of you end up unhappy. Codependents generally have problems with assertiveness. At the same time, they deny their feelings and needs, due to the fact that they were shamed or ignored in their childhood. They also consciously suppress what they think and feel so as not to anger or alienate their partner and risk criticism or emotional abandonment. Instead, they rely on mind reading, asking questions, caretaking, blaming, lying, criticizing, avoiding problems or ignoring or controlling their partner. They learn these strategies from the dysfunctional communication witnessed in their families growing up. But these behaviors are problematic in themselves and can lead to escalating conflict, characterized by attacks, blame, and withdrawal. Walls get erected that block openness, closeness, and happiness. Sometimes, a partner seeks closeness with a third person, threatening the stability of the relationship.